I do not have much time to write this morning as the mad exodus of the hotel room and packing are under way. We have a strict appointment with Evert's Air Cargo at 1:00 PM to fly to Kavik River Camp, where the real Alaska adventure will begin. The last few day we have been primarily performing the usual touristy attractions. My hopes are that within 24 hours we will be prowling the tundra in pursuit of heavy antler-clad caribou. Yesterday we made a run up to the start of the Dalton Highway. 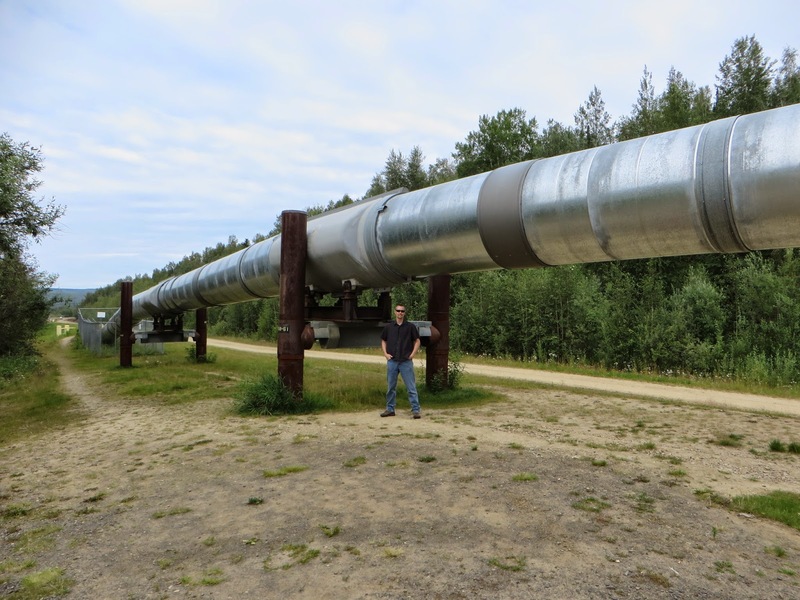 Those whom watch the Discovery show, "Ice Road Truckers," will recognize this as the 400 mile long road to Prudoe Bay. We completed the first 80 miles of the section of the road called the Elliot Highway, which is paved. Paved is a lucrative term as compared to the lower 48 states. Many repairs due to frost heaves and wash outs where visible, along with sections of gravel combined with blacktop. 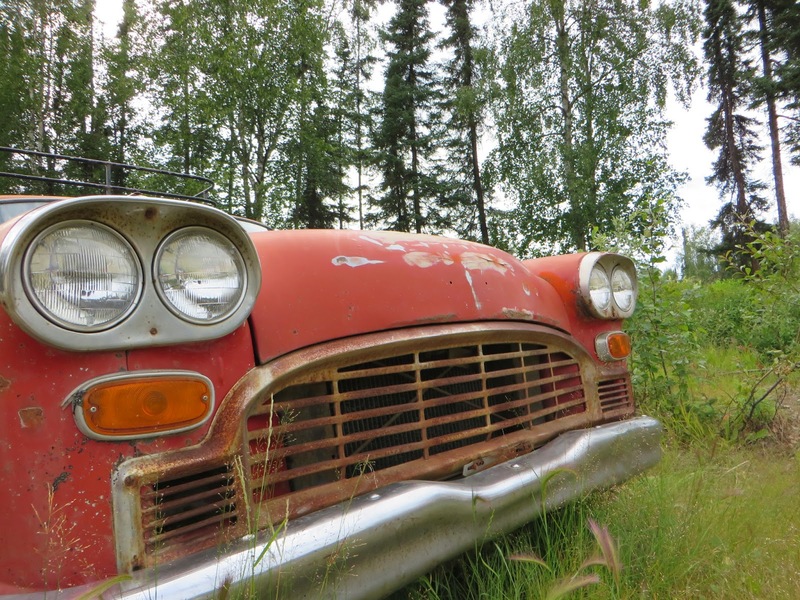 All considered, it was a pleasant drive and a great chance to see the forests of Alaska. 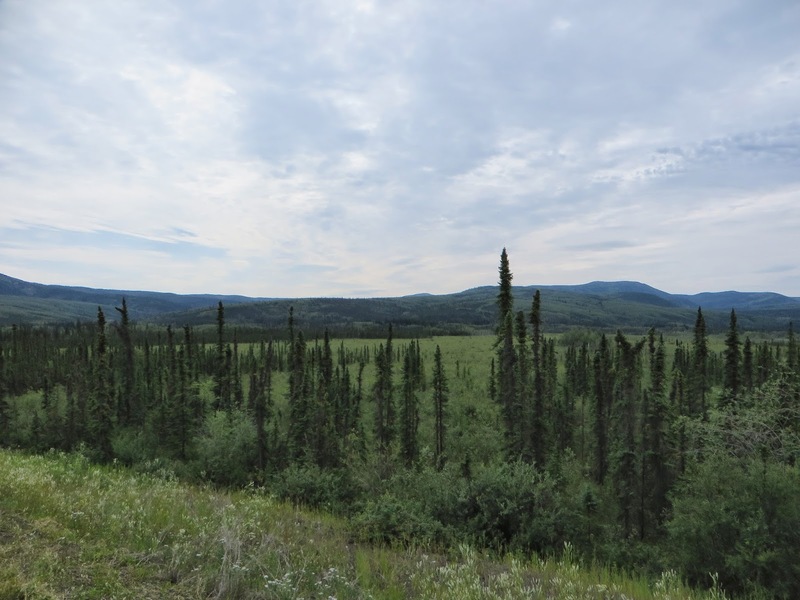 It was also impressive to see just how fast civilization ended north of Fairbanks. Once we were about 5 miles north, the power lines stopped and with that nearly all the homes. Every home after that point lived entirely off the grid, complete with outhouses, solar panels, and softly humming generators. For the next 75 miles we counted only a handful of these outposts. It is hard to describe just how deserted this road is; you have to venture down it to truly appreciate it. A relic left rusting along the Dalton. 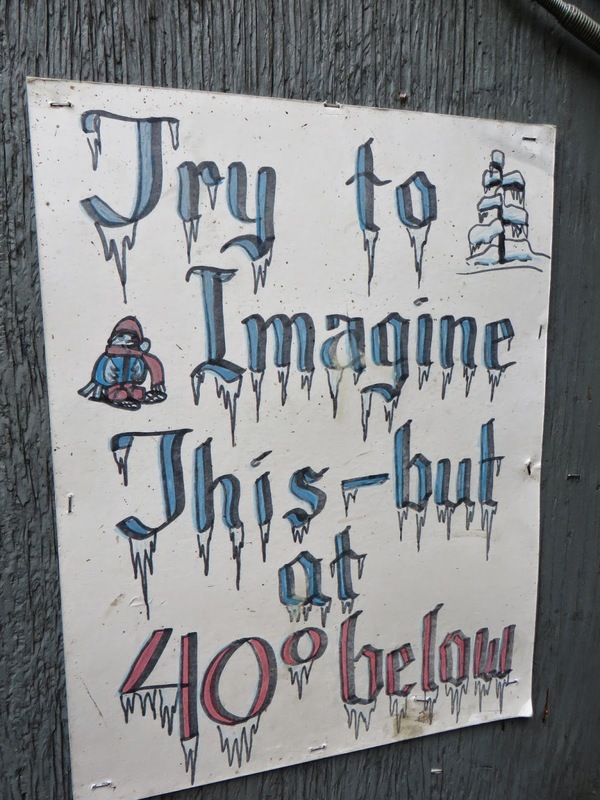 A sign found inside an outhouse at a small store along the Dalton. During one of our stops near the pipeline we encountered our first bear! It was a black bear and just as the ones I am familiar with in Colorado, he was very shy. I could not even bring my camera up before the coal black beast disappeared into the bush, never to be seen again. 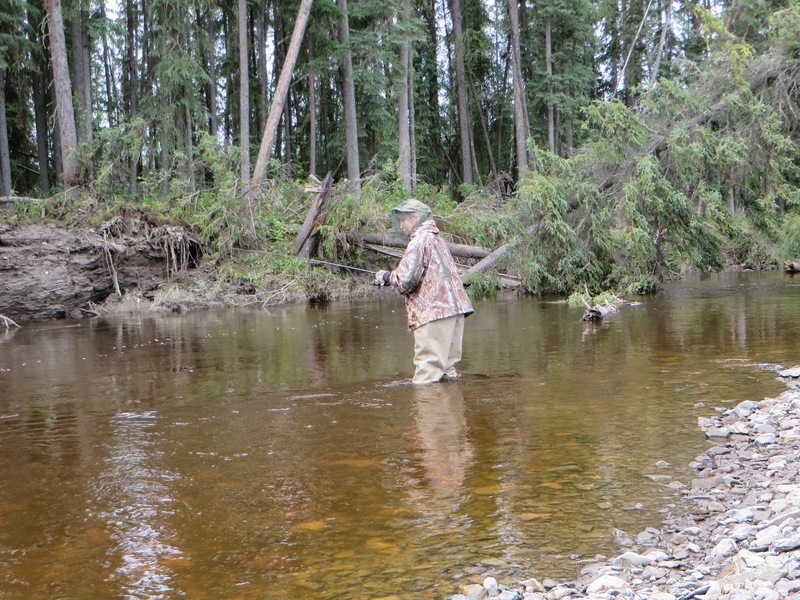 We made several stops along the road to try our hand as fishing for Grayling and Rainbow Trout. 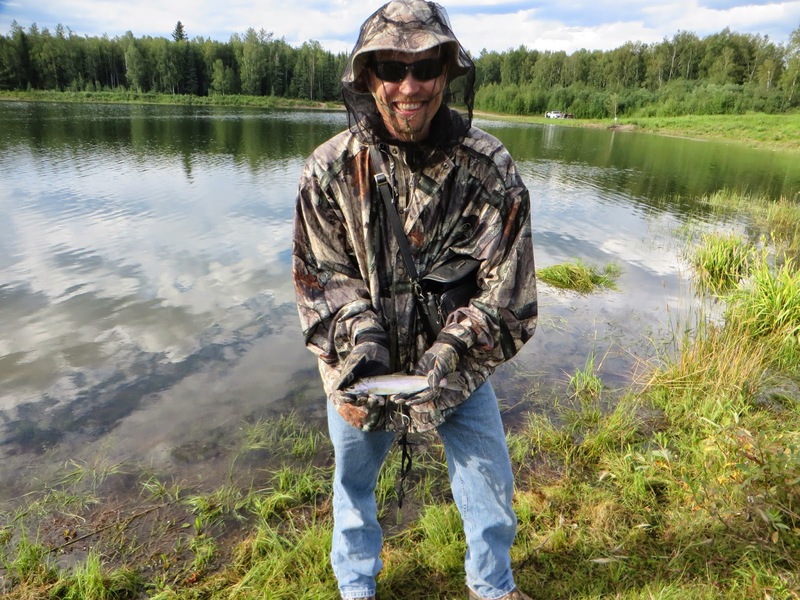 It also was an excellent chance to test out our waders and newly acquired plethora of bug gear. The Grayling could not be found, but each of us managed to land a few tiny Rainbow. It reminded me of home, and if I did not know better I would thought I was somewhere in the Colorado high country. With the bug gear we found out several key factors. With simply a headnet, gloves and a raincoat, one can survive the hoards of mosquitoes with no repellent applied. However, if you expose any skin, they will find it and give you no mercy. As a test case we used one of our Thermacells while I was rigging the fishing poles. After several minutes of running, nearly all the mosquitoes disappeared in the area around us. It was shocking how effective it was! Thermacells get a solid ACHL endorsement. 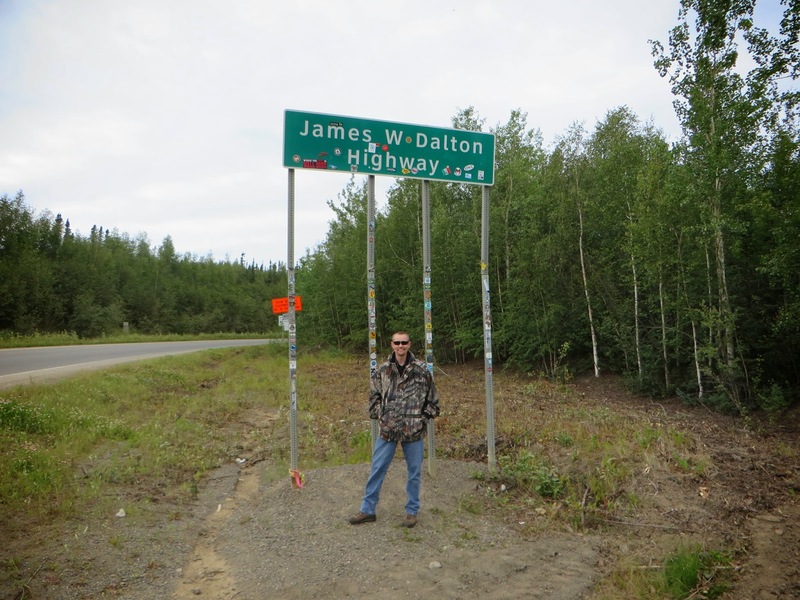 I was sad that we could not venture further up the Dalton Highway. We ran out of time for the day, and I was already stretching our rental agreement pretty thin, if not already broken. As we drove back to Fairbanks, I thought about the days to come. We had seen the forest, it was now time to experience the tundra. I felt prepared to conquer the bugs as we had proven our gear and fortitude while fishing. I am excited for this next portion of the Alaskan adventure to begin. I am entirely jealous of your time spent fishing and just enjoying my Alaska with your mom! Enjoy your mom and my mom Chris! Bears, Wolves, Caribou, welcome to Kavik! © A Colorado Hunters Life and www.acoloradohunterslife.blogspot.com, 2013-to present. Unauthorized . Picture Window theme. Powered by Blogger.